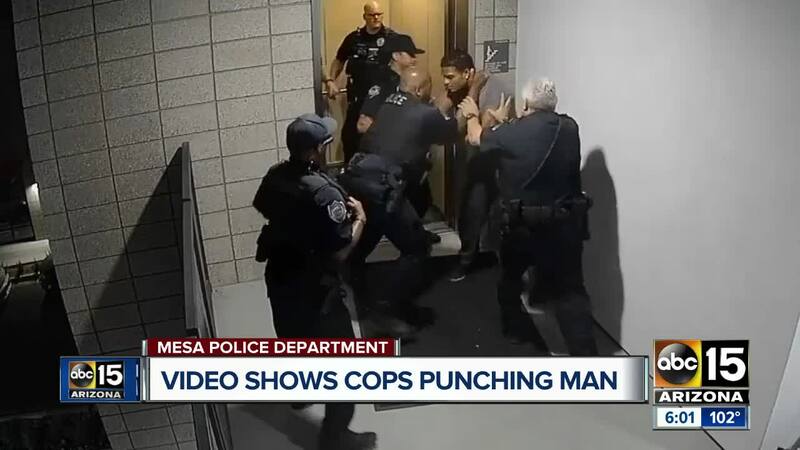 Four Mesa police officers are on administrative leave following an incident in May during which a suspect was punched several times. In an interview with ABC15, Mesa police chief Ramon Batista said on May 23, just before midnight, officers responded to a domestic violence call at an apartment near Main Street and Horne. A woman had reported to police that her ex-boyfriend was trying to break into an apartment. As officers arrived, they made contact with two men leaving the area. When officers directed the ex-boyfriend, 20-year-old Erick Reyes to sit down, he reportedly complied with their orders. Batista said 33-year-old Robert Johnson was heading to the elevator and officers asked him to sit down as well. Johnson reportedly did not comply with their orders, and as they approached him to seat him, he resisted. Officers then struck him several times to get him to comply. According to Batista, four officers were involved. Of them, he says three officers were involved in hitting Johnson, while the sergeant was the lone officer who did not. Batista said he was notified of the incident a week after by a community member, at which point he initiated an investigation into the case. 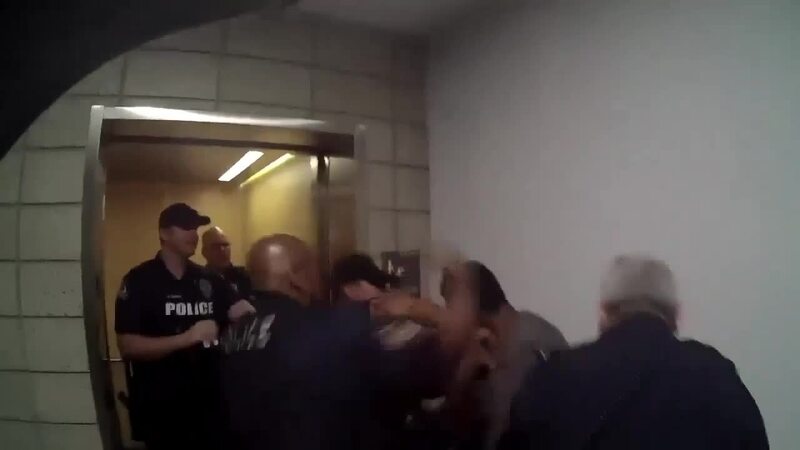 Following the May 23 incident, Johnson was charged with disorderly conduct and hindering. Reyes was charged with disorderly conduct-domestic violence and paraphernalia. "This in no way represents the whole work that is done every day," Batista said of his department. "They're human beings and certainly at first glance, this looks like a mistake." The video made it's way to Johnson's pastor, who is teaming up with two attorneys to help come to Johnson's defense. "There is no explanation that you can justify that level of force," said Pastor Andre Miller with New Beginnings Church. Miller told ABC15 he'd be "happy" if Chief Batista fired the involved officers. "I understand that police have to use force in certain situations," Miller said. "At the end of the day, when do you not use force?" 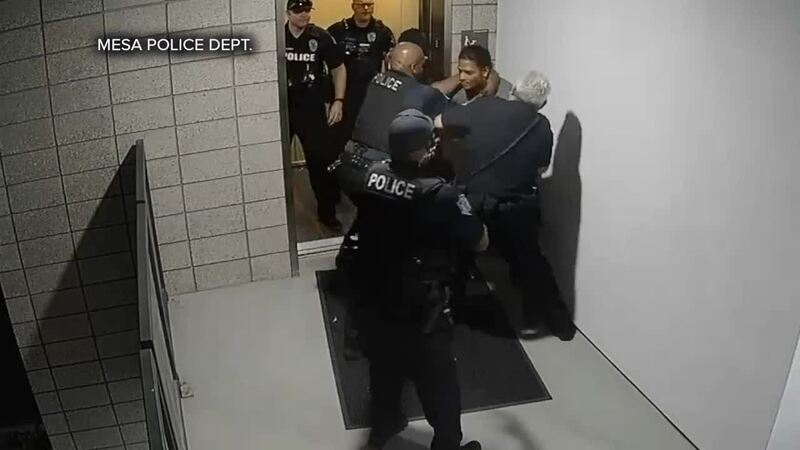 "On May 23rd, 2018, Robert Johnson was beaten by multiple Mesa Police officers while others looked on. Mr. Johnson was cooperative and following police instructions. Mr. Johnson was sitting peacefully against a wall when the assault began. He did not resist. 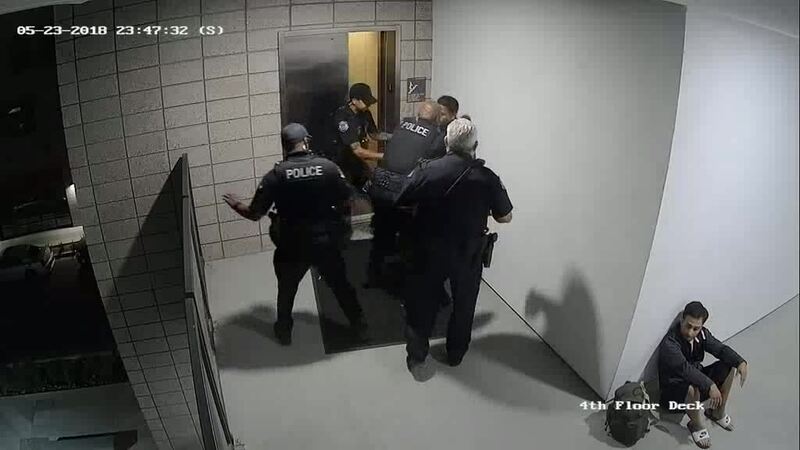 The misconduct of these officers would have gone unnoticed if it had not been captured by surveillance videos at the apartment complex where the assault occurred. We hope and pray that the Mesa Police Department will accept responsibility for the misconduct of these officers. Mesa must take concrete steps to ensure that culpable officers are disciplined, retrained, or dismissed. The Mesa Police Department must develop a law enforcement culture that meets community and constitutional norms and ensures that police and citizens go home safely after police interactions. We plan on holding a press conference Thursday, June 7, 2018 to discuss this incident and the culture of violence at the Mesa Police Department." The Mesa Police Association represents several of the officers involved in this incident. We feel it was grossly inappropriate to release a portion of video with no audio that does not include the full context of the encounter. Furthermore, we do not understand why video is being released when an internal investigation has not been completed. It is important to understand that any use of force, when viewed, is difficult to watch and never looks "good". Our officers were sent to one of the most dangerous calls for service (a family fight with the ex-boyfriend and his friend trying to force their way inside the apartment). Mr. Johnson was not compliant and physically resisted what we feel was a lawful detention. This occurred on the third floor in a very narrow hallway with a short guard rail that would not have stopped anyone, including Mr. Johnson, from falling over to serious injury or death. Officers are trained to be reasonably objective when employing force and to end the confrontation quickly to minimize injuries to all involved. This incident was not left unreported by any means. Several levels of supervision were notified, body camera footage was uploaded, and use of force reports were completed the night of the incident. All Americans are afforded the same constitutional rights of Due Process, which includes police officers. We feel it is detrimental to the investigation to sour the case with the lack of providing facts and full video/audio of the encounter. On May 30, 2018 Pastor Andre Miller, a Mesa resident, contacted Chief Batista regarding a surveillance video depicting a use of force incident. The Chief immediately initiated an internal investigation by our Professional Standards Unit. Four members involved in the incident (one Sergeant and three Officers) were removed from active duty and placed on administrative leave pending the results of the investigation. The incident in question occurred on May 23, 2018 when officers were called to 701 E. Main regarding a Domestic Disturbance with a firearm in the apartment. A female caller advised that her ex-boyfriend was at the apartment with a second male subject and was trying to force his way into the apartment. Officers arrived a short time later and detained both male subjects. The males were later identified as 20-year-old Erick Reyes (the ex-boyfriend) and 33-year-old Robert Johnson. Johnson was charged with Disorderly Conduct and Hindering Prosecution. Reyes was charged with Disorderly Conduct DV and Possession of Drug Paraphernalia. During their contact with Mr. Johnson, a use of force incident occurred which was captured on surveillance footage from the apartment as well as multiple body worn camera angles. The surveillance footage was released yesterday (06/05/18) along with Chief Batista conducting on camera interviews with multiple local news agencies about this incident. In these interviews Chief Batista confirmed three officers and a sergeant were removed from active duty and placed on administrative leave. Chief Batista spoke about a special directive ordering a prohibition on face, head, and neck strikes unless there is active aggression being exhibited by an individual toward the officer. He discussed his vision for the culture he wants within Mesa Police to include communication, respect, and professionalism in every encounter inclusive of a review of policy, procedure and training. We have released the police report and body camera footage of the incident. An internal investigation is underway." "At first glance this video is appalling. It would be irresponsible of me to convict these officers in the court of public opinion before they are guaranteed their constitutional right to a fair trial as I understand there is a criminal investigation. I have been told that these police officers are on administrative leave until this investigation is completed by an outside organization. I am eager for due process to take place. We hired Chief Batista last year to focus on making sure our police department is fairly serving the public. Leadership change takes time and I have full faith he is focusing on the issues that plague our community." "Your Mesa Police Officers answer nearly 1,000 calls for service each day and do so in an overwhelmingly professional and positive manner. These police officers are amongst the best trained and best equipped anywhere. As a police labor organization deeply invested in our City, our Police Department and the lives of our residents and our officers – and as an organization that represents two of the officers involved – we understand the concerns raised by the recently released video clip. At the same time, we agree wholeheartedly that the public has the “right to know” the entire story. With that said, it is important to understand that this video clip contains only one small piece of the complete picture. As you will learn, this incident is much more complex than it has been portrayed solely by reliance on the released video snippet. 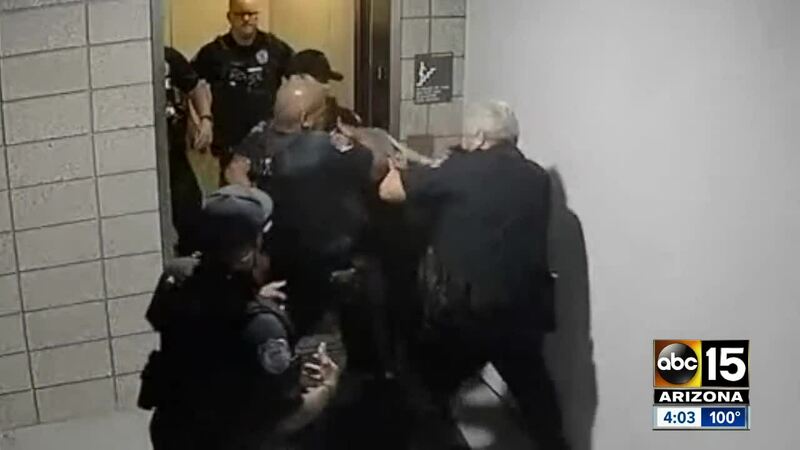 To add some context to the video, it is important to understand that the Officers were responding to a “domestic dispute” that included a subject attempting to force his way into an apartment as well as the report of the presence of a gun. The Chief of Police has already ordered an investigation into this incident, based largely on the video clip. Once the investigation has been completed, we hopefully will have a much better understanding of exactly what took place. We are also hopeful that this investigation will be done in a fair, impartial and timely manner. During the investigation, potential criminal conduct and policy compliance will be examined. At this point, we urge caution and patience rather than a rush to judgment. It is important to remember that anyone accused of wrongdoing in our country – including a police officer – is innocent until proven guilty. Each of us has the constitutional right to a thorough, impartial and fair hearing, a hearing where the findings are based on all available evidence, not on emotion, conjecture, a prejudging of the allegations or a single video clip. It is also important to realize that some police issues require – in fact they demand – the use of physical force to control a situation. Consequently, when physical force and/or violence is applied, it is never pretty and always disturbing. Finally, we hope everyone intent of forming an opinion about this situation will take into account that the officers involved in this incident represent a wide range of experience, training, background, ethnicity, and rank. At the end of the investigation, we expect the results to be made available to the public. We sincerely thank you for your patience and understanding of the process."